Every now and then you just need a good taco. I’m not talking about fast food tacos. I’m talking high-quality, handmade tacos that are packed with flavor. You don’t have to search high and low for an authentic taco joint. 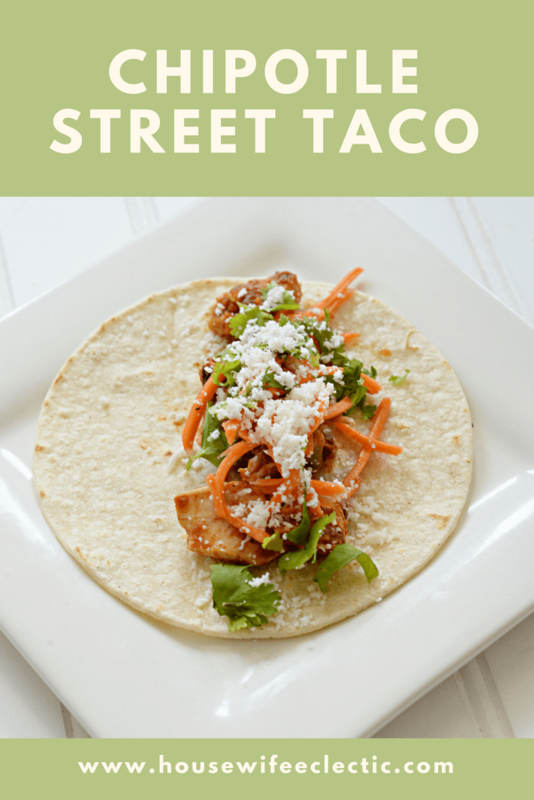 Make your own gourmet street tacos at home. It’s easy and will satisfy your craving. But one of the challenges with tacos is finding the right side. Sure, there’s chips and salsa. But that’s so cliche. Why not mix things up with chimichurri mac and cheese. That’s right: tacos + mac and cheese = pure bliss. If you’re not familiar with chimichurri, it’s similar in concept to pesto, but uses parsley and oregano instead of basil. It comes from Argentinian cooking and is fantastic on meats. 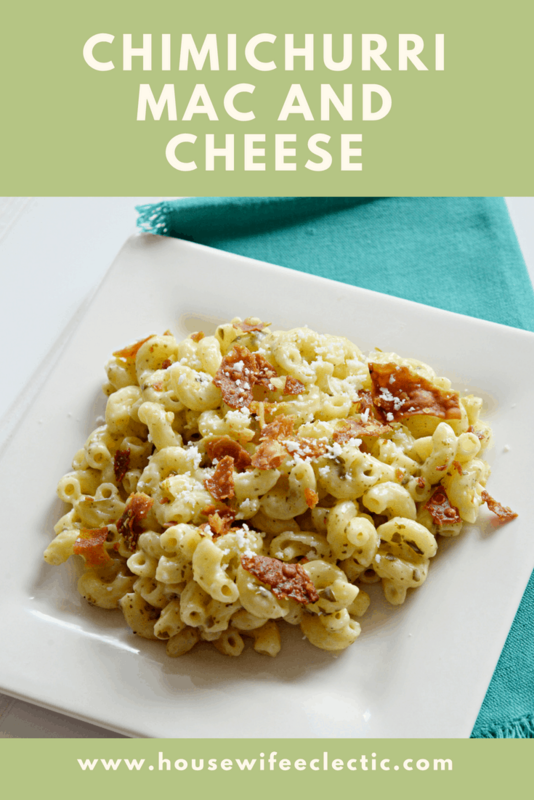 But when you include it in mac and cheese it adds an entirely extra level of flavor that blends well with the tacos. 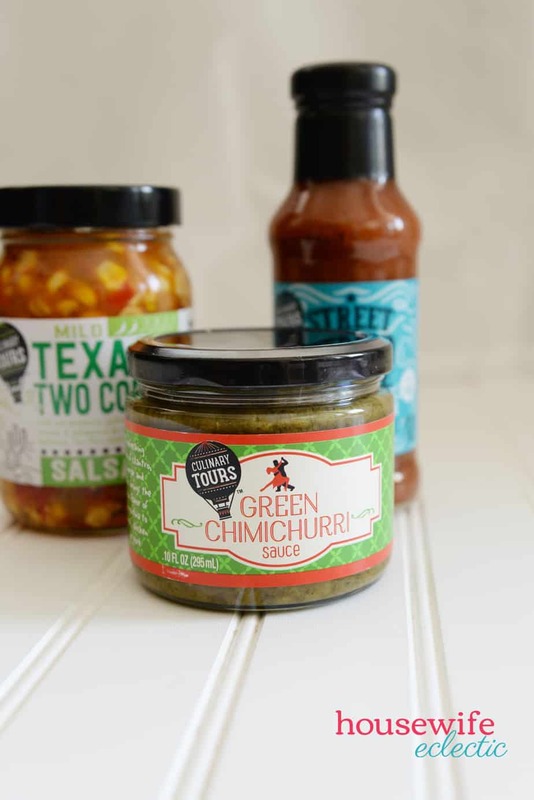 I have been looking for a good chimichurri sauce for ages and this one from the Culinary Tours is everything I hoped for. 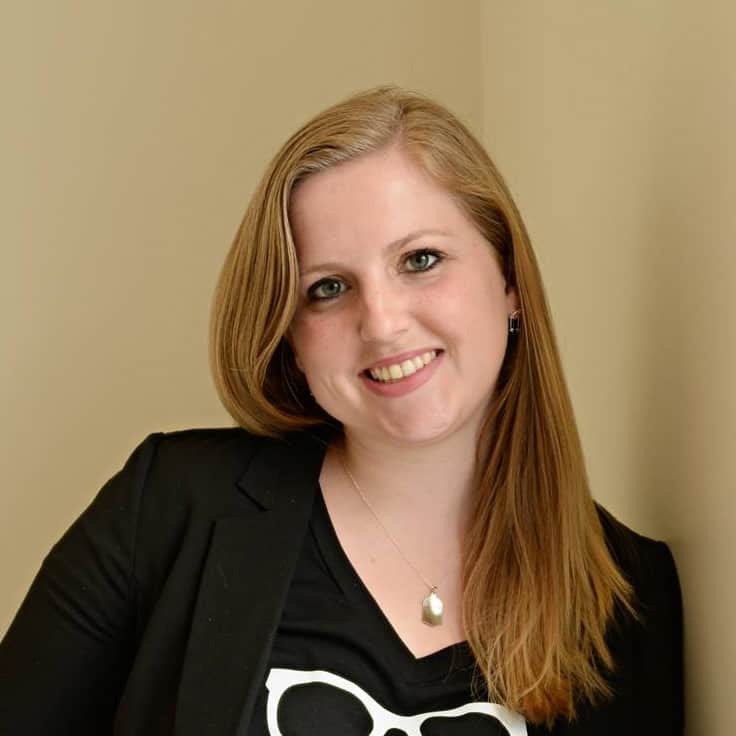 Culinary Tours are products inspired by different cultures and flavors from around the world. They are the perfect way to travel the world, all through food. 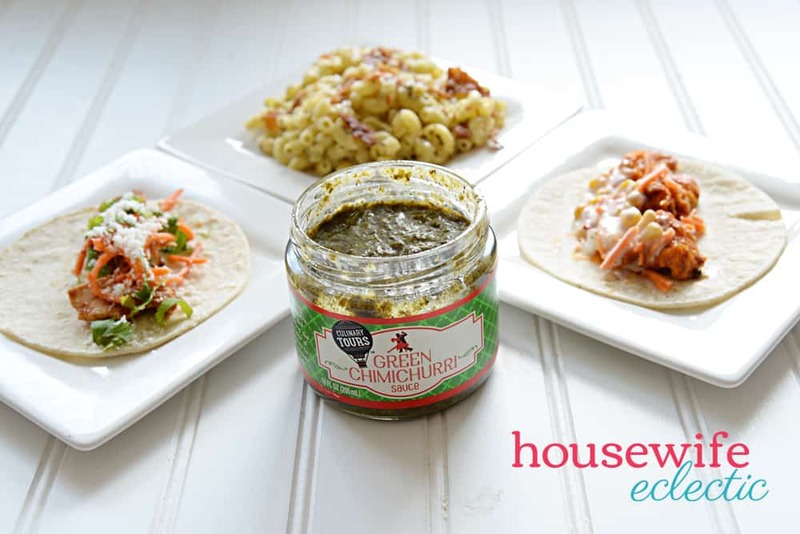 I’m going to share two street taco recipes, and my chimichurri mac and cheese. All of these recipes use products from Culinary tours to take them to the next level. Both of the tacos tend to be a little on the spicy side, but have levels of complexity that cut through the heat. 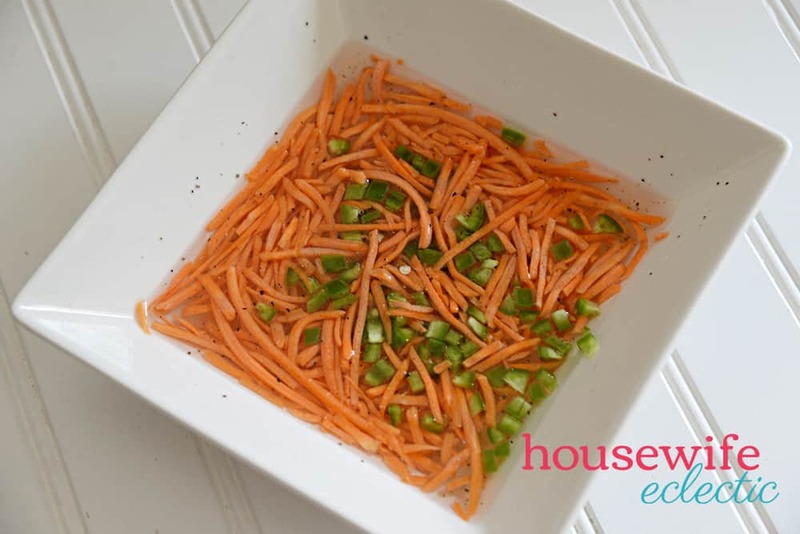 One thing both recipes share in common though is a carrot and jalapeno pickled slaw. It’s not the traditional topping for a taco, but it serves an important role on these tacos: it adds some acidity, sweetness, and juice to cut through the heat. Combine the sugar, vinegar, salt and pepper in a bowl. Mix well. Add in the shredded carrot and diced jalapeno. Mix into the brine. Cover the bowl with plastic wrap and let it sit at room temperature for at least 30 minutes. If you want to prepare over night, place the bowl in the refrigerator. 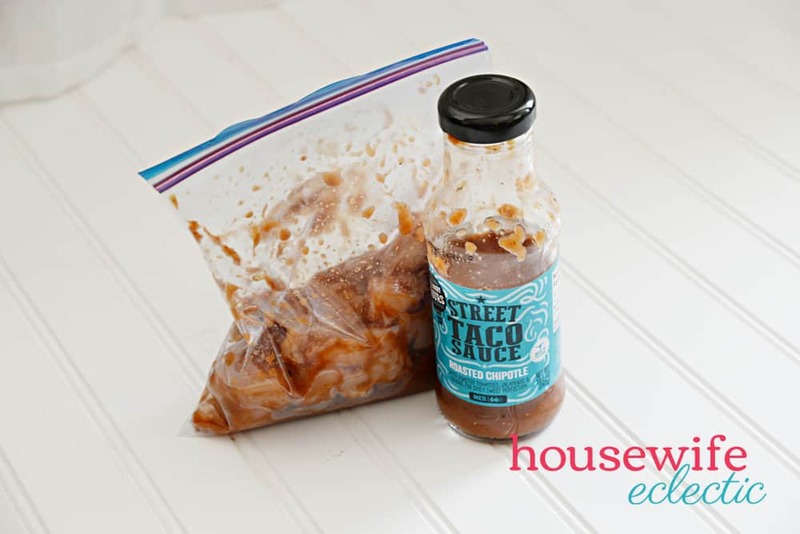 Cut the chicken into bite-sized pieces and place in a sealable plastic bag with half the bottle of chipotle sauce. Mix the chicken well so all pieces are coated and let it marinate for about an hour. Once the chicken is done marinating, add some olive oil to a pan and saute the jalapeno for about 4-5 minutes. Add in the chicken and cook until the chicken is done. Toward the end of the chicken cooking, stir in ¼ of the remaining bottle of chipotle sauce. Stir well. The chicken should absorb most of the sauce, leaving each piece with a nice chipotle coating. Why You’ll Love It: These tacos by nature have a simple, dry heat. The carrot and jalapeno slaw adds sweetness and acidity, making a balanced taco that’s delicious. The cilantro and cotija cheese add that extra level of authenticity. In a small mixing bowl, combine 1 tablespoon of vinegar with 1 cup of milk. Cut the chicken into bite-sized pieces and to the mixing bowl. Place the bowl in the refrigerator and allow to marinate for a half hour. Heat vegetable oil in a pan over medium-high heat. Remove the chicken from the milk and dredge in flour. Fry the chicken in the oil, flipping the pieces halfway through. Remove from the oil and allow to rest for a few minutes on a paper towel lined plate. In a medium mixing bowl, melt the butter. Combine the melted butter with the buffalo sauce. Add the fried chicken and toss in the buffalo sauce until all pieces are well coated. 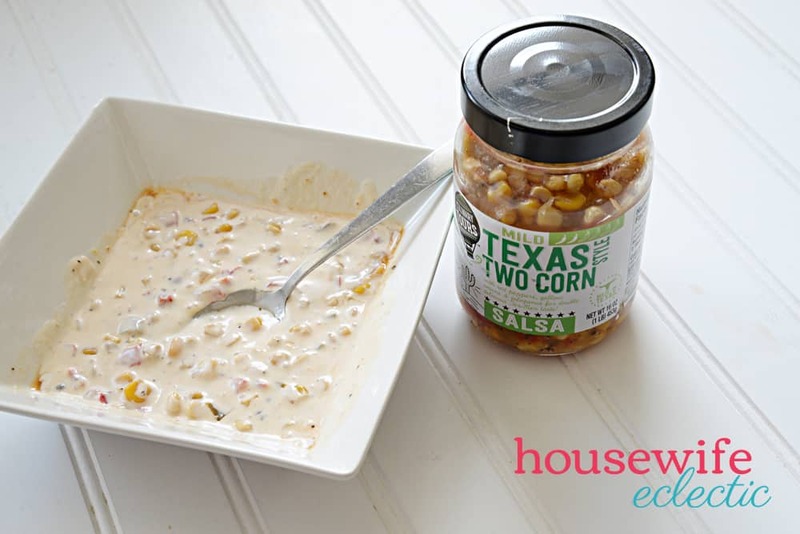 Prepare a ranch corn salsa by combining the corn salsa and ranch in a bowl. Mix well. Assemble the taco by placing the chicken on a corn tortilla. Top with the carrot and jalapeno slaw, and the ranch corn salsa. 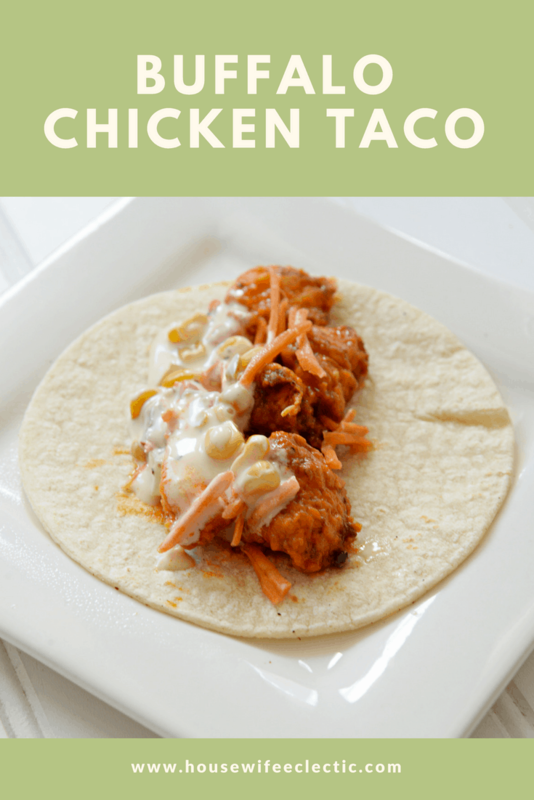 Why You’ll Love It: If you love buffalo chicken wings, you’ll love these tacos. The buffalo chicken has that delicious tangy buffalo heat, but the ranch corn salsa and carrot and jalapeno slaw balance it out with a little bit of coolness. It’s amazing. Prepare the elbow pasta according to package directions. In a medium saucepan, melt the butter. Whisk in the flour to form a roux. Slowly add in the milk while whisking. 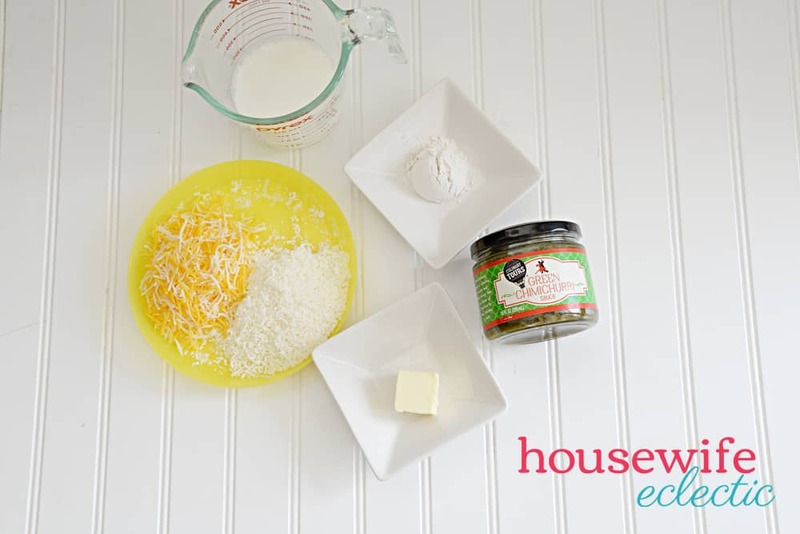 Continue to whisk while adding in both types of cheese, forming a creamy cheese sauce. Pour the cheese sauce over the drained pasta and combine well. Add the chimichurri and salt to the mac and cheese. Stir together. Fry the wanton wrappers in a pan with vegetable oil. Remove to a paper towel lined plate to allow to cool. Crush and crumble the wantons wrappers over the mac and cheese. Why You’ll Love It: Come on, who doesn’t love mac and cheese? This mac and cheese goes beyond the standard fare though, adding in the extra flavors from the chimichurri. The crushed wanton wrappers add a nice textural crunch along with some extra saltiness. It’s seriously so good. Of all of these recipes, I am not sure I could pick a favorite. They are all that good. The Culinary Tours line makes being a culinary adventurer easy and accessible! Found at your locally owned and independent grocer—find a grocer near you here: https://www.afstores.com/retail-members/find-a-retailer/.